Gives you a brilliant clean plus Jet-dry® shine without re-washing thanks to its unique all-in-one technology. Revolutionary pre-soaking Powerball® tabs burst into action to help soften the toughest food residues. Powerful cleaners remove even the toughest stains, like coffee and tea and gently scrubs your dishes, glasses, and silverware sparkling clean. Jet-dry® rinse agent action helps rinse away residues, eliminating spots and film for a sparkling shine. Application: Automatic Dishwashers; Applicable Material: Ceramic; Glass; Metal; Plastic. INNER PACKAGING: 1 Box Per Case. 60 Tabs Per Box. 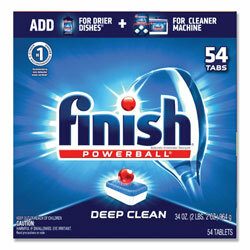 Dishwasher Detergent from Finish®! 987 In Stock today.